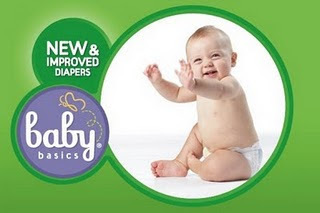 I shared with you the other day where you could get a $4.00/1 printable coupon for Baby Basics Diapers. I’ve learned that the coupon is really $4.00 off of a $7.00 purchase – in case you weren’t aware of it. Read on to learn how to get a great deal! If you happen to shop at Cub Foods, Albertson’s or any other SuperValu Brand store, you will find these diapers on your store shelves. It has been reported that they sell for around $7.99 per package. So, you could get one for only $3.99, after coupon. Right now, when you purchase a package, you will get a Catalina for $4.00/1 Baby Basics diapers — with no minimum purchase required. It is has been reported that some stores have some diapers on clearance for $3.99 – $5.99, so you could get a FANTASTIC deal on diapers right now! You could really “roll” this deal (meaning buy one, get a Catalina and turn around and use that Catalina on your next package and so forth).